The Show Racism the Red Card (SRtRC) education team recently spent a very enjoyable series of workshops with Arniston Rangers’ 2002s, where they explored the dangers of Sectarianism and it’s consequences within Scottish society. Over 3 separate 2 hour sessions the boys explored concepts surrounding prejudice, stereotyping and Sectarian attitudes, whilst looking at how these affect relations within football and society. The boys learned about the history behind Sectarianism in Scotland, examined the relevance of it today and within the law, and also explored how it affects us and those who become involved in Sectarian behaviours. The educational sessions were complimented by coaching sessions from Red Card ex-professionals Michael Weir and Derek Ferguson who put the boys through their paces on the pitch and echoed the workshop messages of tolerance and inclusion. The boys were eager and willing throughout all sessions and their enthusiasm to learn is something to be proud of. 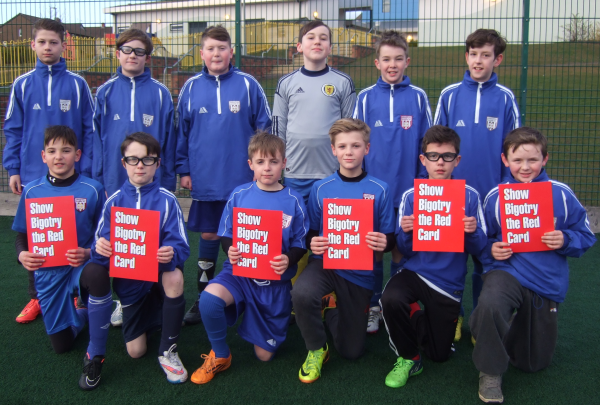 SRtRC look forward to seeing them representing the campaign during our Fortnight of Action in October when they will have the opportunity to replicate the actions of all professional teams in Scotland by holding up our Red Cards prior to kick off. Thanks to Keith Wright (Scottish FA Development Officer – Mid Lothian), Peter, Graeme and Darren (Arniston Rangers FC) who were all of great support throughout the sessions. The workshops were part of a SRtRC programme of work currently funded by the Scottish Government Community Safety Unit’s Tackling Sectarianism Fund. 3 grassroots football clubs and 3 groups of ‘Hard to Reach’ young people from residential schools around Scotland were included in this year’s delivery.